The government of Sudan cut the country off from the internet as protests against the end of fuel subsidies spread. The release of the annual Freedom on the Net report for the first time includes a chapter on Sudan, authored by Index Award nominees GIRIFNA. This is more than timely, as the country is witnessing a new wave of widespread protests triggered by the Sudanese government’s announcement in late September 2013 that it will lift economic subsidies from fuel and other essential food items. Based on a survey of 60 countries in Freedom House’s Freedom on the Net 2013, Sudan is categorised as “Not Free” with a score of 63, placing it among the bottom 14 countries in the category. As one of ten sub-Saharan African countries surveyed, Sudan joined Ethiopia as the two “Not Free” countries in the region. Kenya and South Africa were categorised as “Free” and the remaining six – Angola, Malawi, Nigeria, Rwanda, Uganda and Zimbabwe – as “Partly Free”. Sudan has invested heavily in its telecommunications infrastructure in the last decade, resulting in a steadily increasing internet penetration rate of 21 percent and a mobile penetration rate of 60 percent by the end of 2012, according to the International Telecommunication Union (ITU). It also boasts the cheapest post-paid costs in the Middle East and North Africa in 2012, and healthy market competition amongst four telecommunications providers. However, these infrastructural and economical advantages are highly reduced against the backdrop of a State that has little respect for freedom of expression, freedom of association, participation and peaceful assembly. The Sudanese regime is amongst the worst globally in terms its obstruction of the access to independent and diverse information both offline and online. A global study on press freedom conducted by Reporters without Borders earlier this year ranks Sudan at 170 out of 179 countries surveyed. This clearly reflects that the violations of freedom of expression impacting the traditional print media are also starting to reflect online. The Sudan Revolts, the wave of protests triggered by economic austerity plans that hit the country between June and July 2012, was the first time the authorities implemented a large-scale crackdown and detentions of citizens using digital platforms to communicate, connect, coordinate and mobilise. Additionally, the government increased its deployment of a Cyber Jihadist Unit to monitor and hack into Facebook and email accounts of activists. The National Telecommunications Corporation (a government agency) also engages in the censoring and blocking of opposition online news forums and outlets. YouTube, for example, was blocked for two months in late 2012 in response to the “Innocence of Muslims” video. The attacks on cyber dissidents during Sudan Revolts included the detention of digital activists, such as Usamah Mohammed, for up to two months, the forced exile of Sudan’s most prominent video blogger Nagla’a Sid Ahmad, and the kidnapping and torture of the Darfurian online journalist Somia Hundosa. Moreover, one of the most high profile political detainees from the Nuba Mountains, Jalila Khamis, spent nine months in detention without charges. When she was finally brought to trial in December 2012, the main evidence against her was a YouTube video taken by Sid Ahmad, in which Khamis testified about the shelling of civilians in the Nuba Mountains by the government. Since September 23 this year, authorities have responded to the new wave of protests with unprecedented violence toward peacefully protesting urban dwellers. 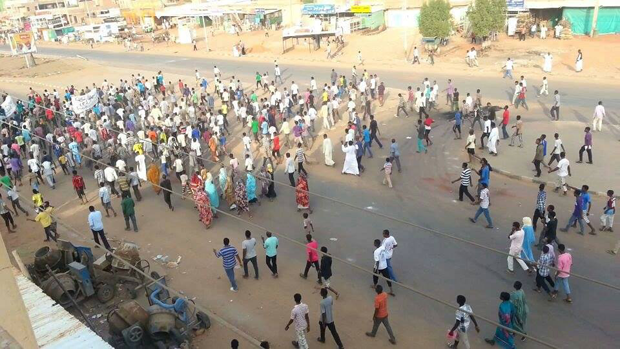 More than 200 have been killed in Khartoum and Wad Madani by live bullets fired by riot police, national security agents, and/or state sponsored militias. According to a government statement, 600 citizens have been detained, though activists say that number is much higher. On Wednesday, September 25, the government shut down internet access for 24 hours. When the internet returned, it was much slower, with Facebook inaccessible on mobile phones and YouTube blocked or non-functional due to a very slow broadband connection. The US sanctions imposed on Omer El Bashir’s regime since 1997 also continue to hinder the free access to the internet and the free flow of information as it limits access to a number of new media tools. This includes limited access to anti virus suites, e-document readers, and rich content multimedia applications that most Sudanese citizens cannot download. The inability to download software security updates makes many users in Sudan vulnerable to malware. Smart phone applications cannot be downloaded or purchased from the iTunes and/or Android stores. Additionally, Sudan has a combination of restrictive laws that work together to impede freedom of expression both off and online, including the 2009 Printed Press Materials Law, and a new Media law that has recently appeared in Parliament, which officials have hinted would for the first include language restricting online content. Additionally, the National Security Act (2010) gives National Intelligence and Security Services the permission to arrest journalists and censor newspapers under the pretext of “national security,”. An IT Crime Law, in effect since 2007 criminalises websites that criticise the government or publishes defamatory materials. All these laws contradict Sudan’s National Interim Constitution, which guarantees the right to freedom of expression, association and assembly. A version of this article has been published on GIRIFNA’s website. The arabic version of the Freedom on the Net report can be accessed here. Dalia Haj-Omar is a Sudanese human rights activist and global citizen.